Whether you’re craving a gyro, a lamb kebob or a hearty serving of moussaka, you’ll want to visit a Greek restaurant in order to get your fill. The following are the best in Maine. From Brunswick to Old Orchard Beach, satiate your hunger for Greek food at these awesome restaurants in the state! For an excellent gyro or a creation combining baklava and cheesecake, visit Chry’s restaurant. They’re also known for their huge, hearty breakfasts. Greek dishes are among the choices at Kosta’s Restaurant & Bar. The Greek Sampler is the perfect way to start any meal, and features marinated chicken skewers, taramosalata, tzatziki, spanakopita and more. Start with Greek salad, and then indulge in Spanakopita or a Gyro when you visit Yamas Bar & Grill. “Yamas” means “Cheers…in good health,” in Greek, and the owners/operators who live this toast in real life ran a restaurant in Greece. You’ll enjoy the entire experience when you dine here. For a Greek menu that changes daily, visit Enoteca Athena. The daily specials include both Greek and Italian cuisines, featuring several classic recipes. The Tzatziki is always on the menu and is a favorite starter. Located in Portland’s art district, the Greek cuisine at Emilitsa’s serves as works of art on a daily basis. Their small and large plates offer a wide range of dishes from all over Greece. Serving traditional Greek fare, Taverna Khione features one of the largest Greek wine lists in the entire country. Their three-course prix fixe meals on Sundays are simply amazing. Visit Jimmy the Greek’s for one of several traditional Greek dishes. Choose from Shrimp Athinas, Greek Lasagna and more. Enjoy one of the many beers they have on tap, too. 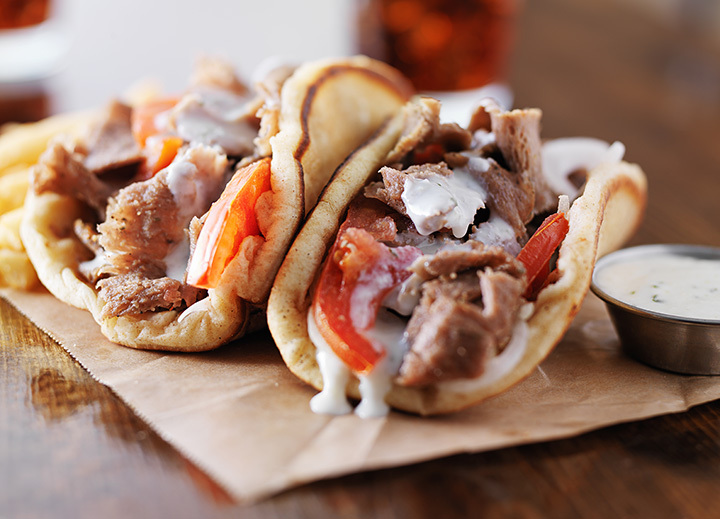 Dine on delicious gyros, pitas, kebobs, baklava and more at Manny’s Greek Grill. Don’t let the strip mall façade deter you from going inside and enjoying the wonderfully prepared food. The customer service is excellent, too.